The C11 nave, possibly pre-Conquest as it may have had porticus, and mid-C12 round tower remain. The chancel has gone. Most windows are later and there are C13 and post-Reformation wall paintings. Southease possessed substantial fisheries in Domesday Book, as well as a church (7, 1), which is probably that which now stands by a green above the water meadows of the Ouse. The present dedication is not old for the mediaeval one is lost. The church looks oddly domestic, with a slightly lower hipped roof at the east end, which dates from the removal of the chancel. Dr Parsons is not entirely convinced that there was a separate chancel, but has suggested that if there was, it was built over a shallow crypt (3) because of the fall in the land. Godfrey believed the oldest part to be C12 (2 plan) and the Taylors do not include it as pre-Conquest. However, the VCH inclines to a C11 dating (7 p74) and this is supported by the excavation of what were interpreted as foundations of porticus, which could suggest a date before the Conquest when they were more usual. 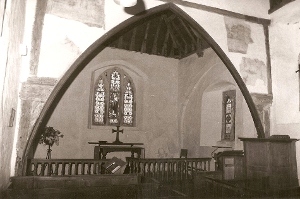 It also may be presumed to have had a chancel at this time. In addition to the porticus, a small round-headed window, now blocked, high up by the north east corner, further supports a date relatively early in the C11. So may the jamb of a narrow north doorway under a C19 lancet, together with a short length of cornice inside at the north east corner of the nave, near the roof. 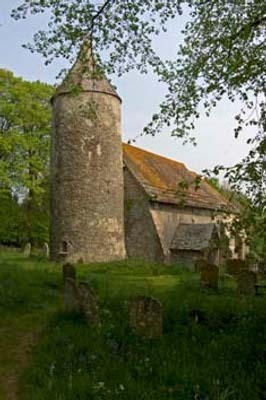 The tower is round and the side against the nave is flat (1 p261), indicating it was added later. It has an irregular conical spire and is hard to date as the only complete external opening is a brick one, low down, which is probably C18. However, higher up outside, are the jamb and sill of another opening, though the form of the head is hard to discern. Like the other two round towers in the Ouse valley (Piddinghoe and Lewes – St Michael) this one is probably C12, in which case the plain pointed and chamfered tower arch, which looks C13 at the earliest, is an insertion. Hussey recorded it (p288) as roughly broken through the wall but plastered, so in its present form it probably dates from after he saw it in c1850. Other C12 alterations included a round-headed south west lancet and plain, pointed arches with square jambs, now blocked, which link the nave and the presumed porticus. The moulded abaci of the more complete south one are visible inside. The positions of the arches show that the porticus were not exactly opposite each other and excavation on the south side revealed a narrow extension westward, like an aisle. This could be part of more extensive work at this time, though there is no sign of an arch in the nave wall. The north porticus was also altered, as a pointed piscina shows (see below) and there is a roof-corbel above. Set in the blocking of the south arch is the jamb of a sizeable C13 window with stiff leaf decoration around the base; it is too large to be in its intended position. In the north arch is a complete lancet, which is also likely be reset and to be part of the late C12 work in the porticus. Early drawings, including the Sharpe Collection one (1802) depict the south side, so it is not known whether two C19 north nave lancets had predecessors, though the presence of obviously C19 flintwork around them suggests that any predecessors were wider. 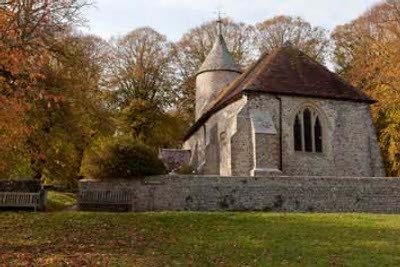 The east wall shows no sign of alteration nor any blocked chancel arch and contains a pointed window with three cusped, stepped lights which is renewed but follows the form of its predecessor. This is late C14 in character and may show when the presumed chancel was removed. Slightly later are the chamfered south doorway and the square-headed windows in the south nave wall; the ogee headed lights show they are no later than the early C15. This may indicate when the porticus and or south aisle were removed, which would be at much the same time as the disappearance of the presumed chancel and perhaps connected. Inside the truncated church, a chancel was created behind a timber and plaster partition, which has a pointed opening like a broad arch spanning the whole breadth of the church. This may be substantially post-Reformation, but is built around a rood-beam with original painting, so the arrangement is pre-Reformation. The roofs are hard to date but many timbers, including a tiebeam with curved queenposts, probably belonged to the same work, together with some timbers of the south porch. Post-Reformation work is poorly documented. 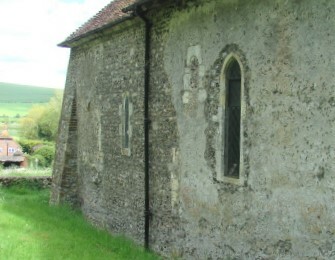 It includes the heavy buttresses at the east end, especially at the south east angle, and repairs in brick both to the tower window noted above and the south east lancet of the nave, both probably altered in the C18, though the Sharpe drawing is not clear. No dates are known for C19 alterations, which include the north lancets and possibly the tower arch (see above). W E Godfrey undertook repairs in 1949-50 (ICBS). Altar rails: Early C17, with turned balusters. Aumbry: (North ‘chancel’) Plain square-headed, probably inserted when the church was reduced. It is further evidence that the present arrangement is pre-Reformation. Benches: (Nave east end) Simple and probably C17. Consecration crosses: (West wall) Probably C13. Font: It is formed, unusually, of several blocks of ashlar, with a plain square bowl and attached round corner-shafts on the base. It is possibly C12 but, if so, has been heavily retooled. Glass: (North nave, second window) M Douglas Thompson, 1990, with prominent leading (www.stainedglassrecords.org retrieved 18/3/2013). Symbolic and centred on a tree. 1. (North and west walls of nave) These were found and conserved in 1934-35 (4 p3) and dated then to the early C13, though Pamela Lady Wedgwood suggests they are early C14 (5 p9). The red and ochre colours are faded, so not all can easily be identified. The north wall shows scenes from the Life of Christ, with ornamental friezes above and below. Particularly clear is the Entry into Jerusalem with Christ on a donkey. Other identifiable scenes include Christ before Pilate, the Scourging and a small part of the Crucifixion. On the south wall, would have been previous scenes from the Passion. 2. (West wall) Christ in Majesty in a quatrefoil with a censing angel and symbols of the Evangelists. 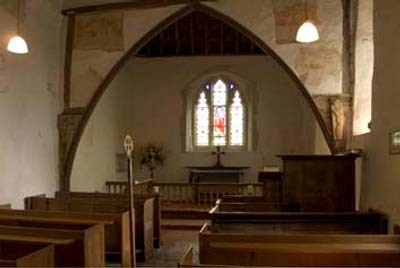 Its position here might imply that there was no chancel arch since it was usual to place such paintings above it. In view of the wider range of colours, Rouse thought this later C13, and pointed to similarities to manuscripts of the period (4 p10). 3. 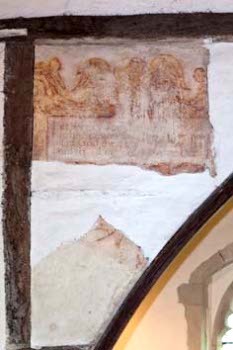 (North wall) Traces of a possibly C15 St Christopher, painted over the C13 work. 4. (Partition) Incomplete late C17 biblical texts in a reddish colour, with cherubs. Pews: By J Skelton (5 p10) and derived in design from the C17 benches noted above. Piscina: (Outside by north porticus arch) Late C12, plain and pointed. Pulpit: A two-decker of uncertain date, incorporating C17 panels. 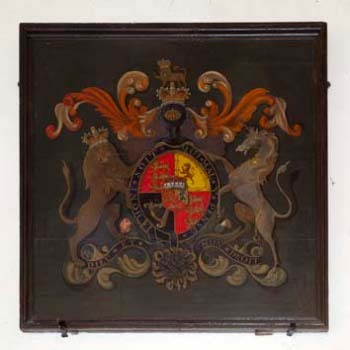 Royal Arms: (Over doorway) George III, after 1802. The lion and unicorn are unusually vigorously painted, with plumes above them. Stoup: (South doorway) Triangular head, apparently formed from a plain late C12 capital, probably when the church was reduced in size.